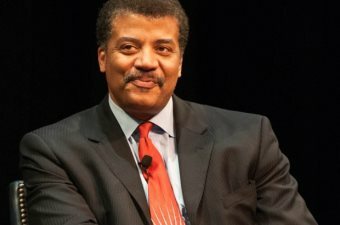 AFRICANGLOBE – Creationists find evolution so offensive that this week they attacked Neil deGrasse Tyson and his show Cosmos over the claim that stars evolved and created life as we know it. In episode 8 titled, “Sisters of the Sun,” Tyson highlighted the stellar evolution and explained in detail the life and death of stars. The continued use of the universe’s actual timescale, an estimated 14.8 billion years to now, is a thorn in the side of creationists who know anything older than 6,000 years brings their entire myth to its knees. Yet we do not need to the Bible to know if stars are still being born. Astronomers at from a collection of Universities from the US to Germany have observed such phenomenon, a star being born 800 million light years away. This coupled the Hubble Space Telescope having located massive amounts of stellar nurseries and has helped us fully explain the birth of stars. Not surprisingly AiG’s own Danny Faulkner, an astronomer by degree, but not in practice claims that if stars are being formed today that we do not need science to explain how because God has the ability to make such things happen on his own. This kind of thinking is what stunts scientific growth in the US and around the world. Faulkner and those like him aren’t looking for natural answers to the amazing universe we inhabit and simply credit anything and everything to God. When science does make a massive discovery that happens to through a wrench in their faith based beliefs, they simply reject the science. AiG claims the idea that stars created the chemicals for life is nothing but an invention my “big bang cosmologists,” or as the rest of the world calls them, scientists, who realized that they needed a way to explain how the atoms and chemicals needed for life on earth could not have been created during the big bang, in order to explain away God they had to invent the story that stars created these chemicals. However they brush over all the scientific evidence that confirms the stars do in fact create the chemicals needed for life and the chemicals we find in all of life just happen to be found in all the stars. In fact, in this new episode and one previous, Tyson explains exactly how we know the composition of the stars, something that has been understood for many generations. AiG closes their argument against stellar evolution by claiming the naturalist explanation for life is tragic and shames Tyson and the writers of Cosmos for not glorifying God, who they believe is the creator of all things, and then refer back to what they call creation week, this is the same creation week that has light being created before the sun and stars. Just like each week though, AiG treats us to a list of Bible versus and fail to ever provide a link to peer-reviewed journals that discredit the claims of Tyson and Cosmos. Relying on Biblical scripture is no way to explain our universe and until creationists realize this they will continue to be offended week in and week out as Tyson explains with great eloquence the truth of our cosmos.